Hario is known for making quality glassware and excellent coffee accessories like the Hario V60 02 Ceramic Coffee Dripper. Here are some of the features of this product. 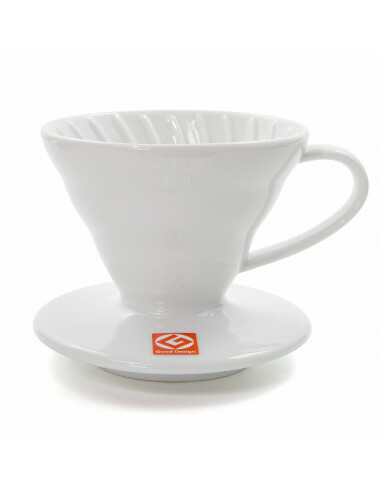 The V60 name comes from the design of dripper. The V is derived from the cone shape of the dripper which looks like a letter V which has a 60 degree angle. This dripper has a single large hole that lets you determine the flavor of the coffee that you will be making because it allows you to control the water flow. The Hario V60 02 Ceramic Coffee Dripper comes with spiral ribs that helps to get the most out of the coffee expansion by enabling air to pass through in order to escape. It is bigger than most drippers in the market. That bigger size is one reason why it is preferred by many baristas and cafes. The ceramic body of this dripper is made with the same high standards that have made the Hario name a favorite among coffee lovers. It comes with a free measuring spoon that perfectly matches the dripper. This dripper can brew up to six cups of coffee depending on the size that you are using. It has excellent heat retention which allows you to enjoy your coffee for a longer period. Because of the high quality ceramic body used in the Hario V60 02 Ceramic Coffee Dripper, cleaning is a lot easier as compared with other similar products. It comes with a free measuring spoon. The V60 02 Ceramic Coffee Dripper provides more extraction than other filters. This beautiful product is going to enhance your collection of coffee accessories, but it’s not just for decoration, because it also scores well when it comes to functionality. Hario (The King of Glass) was founded in 1921, since then they have become the heatproof glass manufacturing giant in Japan. Their history began by producing and selling physical and chemical-use glass products and after decades of hard work and research, they produced the very first Hario Glass, which is made of purely natural materials to refine heatproof glass, thus also taking care of their environmental impact. Hario brings together chemistry, glass products, and coffee. nowadays, Hario has become known as the coffee industry leader in pour over brewing equipment. Trusted by many all over the world. With its superb craftsmanship, Hario brings to you products that will surely make your coffee experience an unforgettable one, one cup at a time.